I would like to first take this opportunity to wish my beloved and beautiful wife a happy birthday!!! She turned another year more beautiful on Saturday, Sept 8. I didn't post this most joyous news earlier because, well, I wished her it in person! Anyway though... Busy weekend, I must tell you. Our house went up for sale last Tuesday (see previous post), and we had some people through on Saturday. 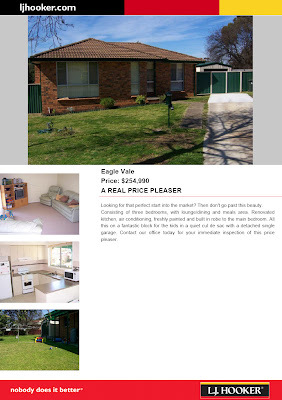 One of them was soo inspired to buy our much loved house, that he gave us an offer we couldn't refuse, so we accepted. We signed contracts etc on Sunday, so the buyer has 10 working days cooling off where he can change his mind. But we don't think he will. The only obstacle would really be the building and pest inspection report. And since we have recently been sprayed for preventative measures against termites, and we have had our house regularly fumigated the pest inspection will be fine... And our house is structurally sound, with the exception of the back fence, but they want to put up a new one anyway!! But we're still holding our breath for the next 8 working days! I would also like to welcome into the world my 2 new nieces! One was born to my Canadian family, and she's been named Ava born on Friday, Sept 7 i believe (Congrat's Denise and Jeremy!!! I can't wait to see you in December!!!!) and the as-yet-to-b-named baby to my brother and sister in law here (Harry and Amanda) born on Monday, Sept 10! Congrat's to you both!!! I won't be putting up pics of them, so I apologize to all, but I'm sure that you're used to dissapointment by now if you're a regular reader.... It's like watching and waiting for the kettle to boil, only the kettle isn't even plugged in, and you really can't wait to drink up that nice hot chocolate that's just waiting for the boiling water... It's that level of disapointment that you can all expect here. You keep reading, hoping for some glimmer of greatness, something that'll make this minute worth-while. Too bad for you my friend, too bad for you!!!! I did just have a great day in the lab. I've been having some pretty serious technical problems doing a certain procedure which I made a tool to help, and it works great... So I am now an ultimate champion of the world at it now... So I will cure some diabetic mice tomorrow morning. I probably won't let you know how it turns out as I am now only killing time to catch the train...But you love it! Must run to the train. Well the for sale sign finally went up on my house yesterday, and the pics are on the internet!!! (see: here). Below is what you get when you "Print Brochure". 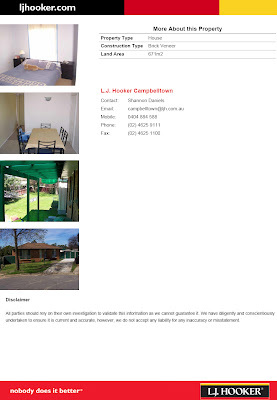 So, if any of you fancy buying a house in Oz that has been treated with lots of love and care... Make me an offer. ... Preferably more than the asking price... But that may be asking a bit much. The other big thing that happened, is Maddie has learned the ancient art of crawling. She's a bit slow at the moment, but she's getting better daily. And when she gets where she wants to go, she has a little fit of joy. (Said with a big grin from a proud Dad). So, her reign of terror begins now. I don't think Alex truly appreciates what is about to happen though. She loves him. She watches him all the time. ANd up until now, he has been able to simply walk away. Not any more little bub. Not any more. Anyway though, below are two pics I lifted from Bec's website showing Madison crawling.